Canterbury is a wonderful Cathedral City full of history overflowing with medieval character in every corner. This small but must see city is very popular with tourists visiting the historical landmarks such as Canterbury Castle, the 12th century Eastbridge Hospital, the row of Tudor style Weavers houses, St. Peters Street, St. Martin’s Church, St. Augustine’s Abbey and of course the magnificent Canterbury Cathedral which dominates the skyline with its three towers and immense presence is one of the oldest in cathedrals England and the most outstanding in Europe. It is the Cathedral of the Archbishop of Canterbury the leader of the Church of England and symbolic leader of the World Anglican Communion. The cathedral is the oldest and most famous Christian structure in England and forms part of a World Heritage Site. It was founded in 597 and was completely rebuilt around 1070. The east end was greatly enlarged at the beginning of the 12th century and in 1174 following a fire it was rebuilt in the gothic style with significant eastward extensions to accommodate the flow of pilgrims visiting the shrine of Thomas Becket, the Archbishop who was murdered in the cathedral in 1170. The cathedral was an abbey until the Dissolution of the Monasteries when all religious houses were suppressed and when Canterbury surrendered in March 1539 it reverted to its previous status of a collage of secular canons. This World Heritage Site also has many museums and art galleries and two of the main museums are the Museum of Canterbury which is full of artefacts and historical information and the adjacent Rupert Bear Museum which is very popular with families and those remembering their youth. 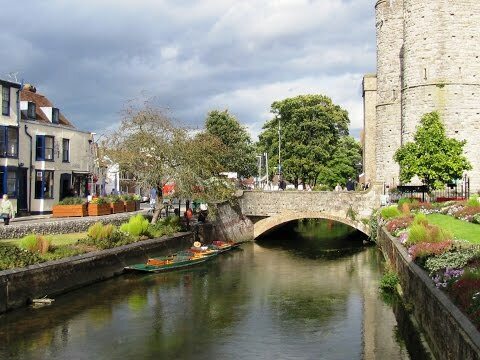 Also very popular in the centre of the city is the Canterbury Tales Visitor Attraction where you can experience the sights, sounds and smells of Medieval England and offers a lot of information about this famous novel and the cities past. Visitors will be able to follow Geoffrey Chauncer and his pilgrims on their journey from London. There are many other amenities to keep the tourists entertained including a variety of guided tours around both the city and the River Stour, the horse drawn Canterbury Carriages around the old town, punting trips and boat cruises along the river. As well as being historical, Canterbury is a modern and vibrant city and invests millions in its thriving tourism industry. One of East Kent’s most popular retail destinations can be found in the Whitefriars shopping centre and the King’s Mile offers a range of specialist and individual shops and the best way to explore and enjoy what Canterbury has to offer is on foot so this is where the walking trails or guided tours come in handy to guide you round the winding lanes and streets, all with their unique identity. Chartham is a village situated on the Great Stour River in the vale of the Kent Downs Area of Outstanding Natural Beauty. It is 4 miles west of Canterbury and houses numerous arable farms and orchards, the church of St Mary the Virgin, an unmanned station and a manned level crossing and a paper mill. The church, located next to the village green, was built around 1294 but the tower is 14th century and renovation took place in 1875 by Oxford University architect George Edmund Street. It contains six bells five of which were made by Joseph Hatch in 1606 which makes them the oldest complete set by the same bell founder in Kent. The paper mill has specialised in the production of tracing paper since 1938 and the Great Stour River provided the power until some point before 1955. There is a dovecote at Burnt House Farm notable for its building’s architectural merit and is a Scheduled Ancient Monument for its importance in sending homing birds to and from important envoys such as the Archbishop of Canterbury. Chartham Hatch is the northern upper part of Chartham, also known as a hamlet, and is surrounded by small woods and orchards of apples and pears. The Village Hall, formerly the school, stands in its centre and there is also a pub the Chapter Arms. No Man’s Orchard was purchased by Chartham and Hambledown Parish Councils in 1996 and the name “No Man’s” was traditionally given to land that straddled more than one parish – no one man’s land. Canterbury City Council has designated the orchard a Local Nature Reserve because of its value for wildlife and to encourage its educational use. It is the first orchard in the UK to honour this title and it is also a Local Wildlife Site designated by the Kent Wildlife Trust, mainly because of the number of lichens and mosses found on the fruit trees. This ten acre site is a great place to visit whatever the season with the beautiful blossom in the spring time, the apple crop in the summer to autumn and in winter the gnarled old trunks and huge branches now showing their age and leaning heavily can be enjoyed. The nature of the reserve is to preserve the old apple varieties so when a tree reaches the end of its lifespan it is replaced with a new planting of suitable traditional variety. The Great Stour Way, which opened on May 21st 2011, runs alongside the river for three miles between Canterbury and Chartham. It is a well surfaced path and is part of the National Cycle Network, route 18, so is ideal for walkers, pushchair and mobility users. Because livestock is present along the path there are a number of cattle grids and wooden kissing gates. The cattle grids allow cyclists to pass over whilst the kissing gates have been designed for large mobility vehicles. For people from Canterbury it’s a gateway to the Stour Valley and to the Kent Downs Area of Outstanding National Beauty. Seats have also been installed along the path and there’s an impressive picnic table with carved river wildlife next to the old Elham Valley Railway embankment. The North Downs Way National Trail is a long distance path running for 153 miles from Farnham to Dover passing Godalming, Guilford, Dorking, Merstham, Otford and Rochester, along the Areas of Outstanding Natural Beauty of the Surrey Hills and Kent Downs. The trail is a mixture of footpath, bridleway, byway and road of which are mainly minor lanes. The North Downs Way also runs parallel to the Pilgrim’s Way between Farnham and Canterbury. The River Stour is the second longest river in Kent and is the major watercourse in the east of the county. The river rises near the village of Lenham, to the east of Maidstone, and joins the East Stour at Ashford then continues to Canterbury. Here the river splits into two main channels creating several islands before continuing on its course and flowing into the English Channel at Pegwell Bay. It has many tributaries and above Plucks Gutter, where the Little Stour joins it, the river is normally known as the Great Stour. We park on the roadside at the village green and walk forwards past the telephone box and turn right just before the bridge along the no-through road called Riverside and then we cross over the railway line and walk to the end of the cottages with the river on our left and turn right at the public footpath sign. We go through the gate and head forwards slightly left to the gate and the road. We cross the road and into the field opposite and head for the right hand corner of the field to the road. We turn left, cross the railway line and walk slightly uphill and take the sign posted footpath on the right to cross two fields. We then walk through the orchard of apples to reach a road where we turn right and follow the road, North Downs Way, into Chartham Hatch. We pass the Chapter Arms pub on the left then at the junction we bear left and take the footpath between the houses to the left of the Nightingale Close sign. We cross over a road slightly to the right into a park and walk to the right of the park following the sign for North Downs Way and No Man’s Orchard. At the end of the park we go through an open gate way and make our way through the wood to come out into No Man’s Orchard Nature Reserve. We pass a sculpture of a snake on the right and then an information plaque on the left. At the end of the reserve we come to another wood and keep following the North Downs Way passing an old settlement on the right called Bigbury. We come to a gate at a road and turn left and walk over the bridge across the A2 and take the path immediately to the right signposted Canterbury 2 miles. We follow the track ignoring a path off to the left. The track bears to the left and we head forwards and at a footbridge and crossroads of paths we head straight forwards over the footbridge following the blue arrow North Downs Way until we come to a tarmac track. We keep heading forwards on the track following the sign for Canterbury. When we come to a roundabout at the main road we cross over and walk down London Road. At the end of the road, with the Monument pub opposite, we turn right and walk along the pavement. We go through the archway called Westgate and wander round the traffic free area to view the Cathedral and then make our way back to Westgate. We now turn left by the side of the river and follow the Stour Valley Way with the river on our right past the gardens on the left and when we come to a bridge we cross over and follow the river now on our left. We follow the track keeping close to the river now the Great Stour Way and cycle route 18. We go under an old railway arch and then past a picnic table carved with wildlife and keep heading forwards along the track through the arch of the bridge under the A2. We keep following the track by the side of the river and go under another road bridge and just follow the track to Chartham. At the road at Chartham we turn right then left to walk to the left of the church which brings us back to the village green where we started. This is a mainly flat walk along good paths and tracks on the North Downs Way and the Great Stour Way which is part of the cycle network route 18. There are a number of cattle grids with large kissing gates for walkers, pushchairs and wheelchairs. There are a few minor roads to cross and some main road into Canterbury centre. Approx 8.5 miles allow 3 hours using OS Explorer Map 150, Canterbury & the Isle of Thanet. Chartham, a small village near Canterbury, Kent. From the M2 travelling east take junction 7 onto the A2 before reaching Canterbury turn right onto the A28 to Chartham Hatch and Chartham. There is a car park and road side parking at the village green. There are public toilets in Canterbury. For refreshments there is the Artichoke Inn and The Local in Chartham, the Chapter Arms in Chartham Hatch and many pubs, restaurants, cafes, takeaways and shops in Canterbury. For the systematic go associated with an organization or a company, whether it be a little scale industry office or perhaps a large scale industry office proper documentation of records are important. Ultra 3 Pro – Liant server Pro – Liant storage system Storage Works or Alpha Server Hot Plug Enclosure. if you agree to pay the price. It’s one of the least expensive quadcopters you can buy (however cheap is not necessarily a superb factor). Today I begin to understand what love must be, if it exists…. When we are parted, we each feel the lack of the other half of ourselves. We are incomplete like a book in two volumes of which the first has been lost. That is what I imagine love to be incompleteness in absence.